Well, The Quilt Studio Sign is done, without any spelling mishaps! The only mishap that I have not is the "new" external hard drive we bought to house all of our photos decided to die after only one week. So, thank heaven for who ever invented digital camera's! I just took another one and here it is! Now I hope that our "computer dude" can "undelete" the pictures from our main computer that I deleted when I put them on the external hard drive. 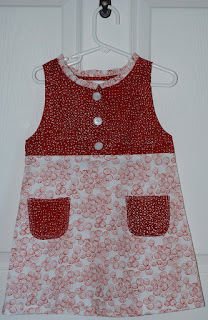 This next picture is of the dress I made my little Nickola today. She's our oldest granddaughter and she loves to wear dresses. This dress is made from the "The Little Vintage Jumper" by Favorite Things. She just loves it, now if the Texas weather would get warm and stay warm, she can wear it! It suppose to be freezing again tonight, this is the time of year when the themometer rides one of the roller coasters at Six Flags! I've cut out another dress for her that hopefully I will be able to finish tomorrow and then Wednesday we will wait for our new grandson to join our family!